Offering you a complete choice of products which include genox 10mg tablet, cytotam 20 mg tablet, tamoxifen citrate 20mg tablet, emend capsule, aprepit capsule and imutrex 7.5mg tablet. Genox tablets 10mg, contain the anti-oestrogen tamoxifen, used to treat breast cancer and endometrial cancer; to prevent spread of breast cancer and to reduce the risk of developing breast cancer in women at risk. Genox tablets 10mg (also known as Nolvadex and Tamofen) are used to treat breast cancer and endometrial cancer. Genox tablets 10mg reduce the growth of early stage tumours and can slow down the growth of advanced metastatic tumours that have already spread to other parts of the body, reducing mortality rates, particularly if taken continuously for 5 years. In women who have received other treatment for breast cancer, such as chemotherapy, Genox tablets 10mg are used as adjuvant therapy, to increase the chances of a cure and reduce the risk of breast cancer returning to the same breast or new tumours developing in the other breast. Genox tablets 10mg also reduce the risk of developing breast cancer in women who are at risk. 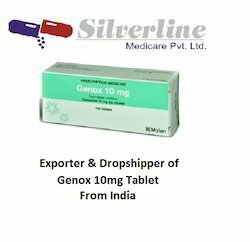 Genox tablets 10mg (also known as Nolvadex and Tamofen) contain tamoxifen, which is a non-steroidal anti-oestrogen, also known as a selective oestrogen receptor modulator (SERM), that binds to the oestrogen receptor on breast cancer cells blocks the action of oestrogen in these cells, which is to promote the development of beast cancer, and stimulate breast cancer cell growth. Most, but not all, breast cancers are sensitive to oestrogen and are known as oestrogen receptor-positive because they are oestrogen-dependent tumours and the cells contain oestrogen receptors. Genox tablets 10mg are more effective on oestrogen receptor-positive breast cancers and can block or slow down the growth of these tumours at early and late stages, as well as preventing the spread of advanced tumours to other parts of the body. Although tamoxifen in Genox tablets 10mg acts as an anti-oestrogen (antagonist) in breast cancers, it can act as an oestrogen agonist (mimic) in other cells, such as bone cells, which can provide some benefits, for example helping to maintain bone density and reducing the risk of osteoporosis (brittle bones), also reducing levels of blood total cholesterol, particularly in menopausal women. Genox tablets 10mg contain the active ingredient tamoxifen citrate, a non-steroidal anti-oestrogen that is used to treat breast cancer. They also also contain mannitol, maize starch, purified water, croscarmellose sodium and magnesium stearate. Genox tablets 10mg (also known as Nolvadex and Tamofen) contain tamoxifen that acts as anti-oestrogen and binds to the oestrogen receptor on breast cancer cells, blocking the action of oestrogen in oestrogen-dependent breast tumours. Genox tablets 10mg reduce the growth of early stage tumours and can slow down the growth of advanced metastatic tumours that have already spread to other parts of the body, reducing mortality rates, particularly if taken continuously for 5 years. In women who have received other treatment for breast cancer, such as chemotherapy, Genox tablets 10mg are used as adjuvant therapy, to increase the chances of a cure and reduce the risk of breast cancer returning to the same breast or new tumours developing in the other breast. Genox tablets 10mg can also reduce the risk of developing breast cancer in women who are at risk of developing breast cancer. 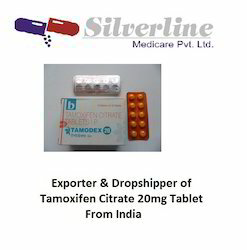 Cytotam (Tamoxifen Citrate) should be taken orally to interfere with the activity of estrogen (a female hormone). This drug has been used to treat both advanced and early stage breast cancer. Cytotam (Tamoxifen Citrate) is a drug in pill form, taken orally, that interferes with the activity of estrogen (a female hormone). Cytotam (Tamoxifen Citrate) has been used to treat both advanced and early stage breast cancer. It has been used for nearly 20 years to treat patients with advanced breast cancer. More recently, it also is being used as adjuvant, or additional, therapy following primary treatment for early stage breast cancer. Cytotam (Tamoxifen Citrate) is usually prescribed as a single daily dose and this should be taken at the same time each day - the actual time does not matter. Some women prefer to take it with food as it may cause feelings of sickness and leave a metallic taste in your mouth. The most common side effect is hot flashes similar to those experienced during menopause. Cytotam (Tamoxifen Citrate) may induce menopause in a woman who is close to menopause; however, it rarely does in young women. Other common side effects include vaginal dryness, irregular periods, and weight gain. In addition, women taking Cytotam (Tamoxifen Citrate) may be at slightly increased risk of developing cataracts. Women who have cataracts before taking Cytotam (Tamoxifen Citrate) may be at slightly increased risk of needing eye surgery to remove the cataracts. There has NOT been a generalized decrease in vision in women taking Cytotam (Tamoxifen Citrate). It is recommended that women taking Cytotam (Tamoxifen Citrate) have eye examinations by an opthalmologist at least every 2 years. Like most drugs, Cytotam (Tamoxifen Citrate) should not be taken during pregnancy. Even though it can affect a woman`s periods Cytotam (Tamoxifen Citrate) is not a contraceptive, so reliable contraception must be used. 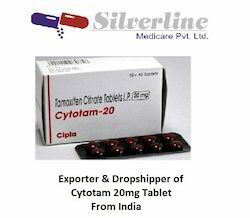 Cytotam (Tamoxifen Citrate) can increase the effect of the drug , used to thin the blood in people prone to blood clots. If you are taking let your physician know straight away. Tamoxifen is used to treat some types of breast cancer in men and women. Tamoxifen is also used to lower a woman's chance of developing breast cancer if she has a high risk (such as a family history of breast cancer). Tamoxifen may also be used for purposes not listed in this medication guide. Do not use tamoxifen if you are pregnant. It could harm the unborn baby. Use a barrier form of birth control (such as a or diaphragm with spermicide) while you are using this medication and for at least 2 months after your treatment ends. You should not use tamoxifen if you are allergic to it, or if you have a history of blood clots in your veins or your lungs, or if you are also taking a blood thinner such as . Before using tamoxifen, tell your doctor if you have liver disease, high triglycerides (a type of fat in the blood), a history of cataract, or a history of stroke or blood clot. Also tell your doctor if you if you are receiving chemotherapy or radiation treatment. If you are taking tamoxifen to reduce your risk of breast cancer, you may need to take your first dose while you are having a menstrual period. You may also need to have a pregnancy test before you start taking tamoxifen, to make sure you are not pregnant. Follow your doctor's instructions. To make sure this medication is not causing harmful effects, your doctor may want you to have mammograms and to perform routine breast self exams on a regular basis. Your liver function may also need to be tested. Visit your doctor regularly. if you are also taking a blood thinner such as (). Taking tamoxifen may increase your risk of uterine cancer, stroke, or a blood clot in the lung, which can be fatal. Talk with your doctor about your specific risks in taking this medication. FDA pregnancy category D. Do not use tamoxifen if you are pregnant. It could harm the unborn baby. Use a barrier form of birth control (such as or diaphragm with spermicide) while you are using this medication and for at least 2 months after your treatment ends. Hormonal contraception (such as birth control pills, injections, implants, skin patches, and vaginal rings) may not be effective enough to prevent pregnancy during your treatment. It is not known whether tamoxifen passes into breast milk or if it could harm a nursing baby. However, this medication may slow breast milk production. You should not breast-feed while taking tamoxifen. 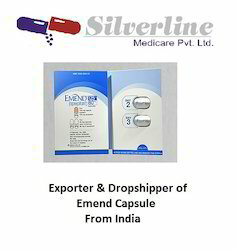 EMEND capsules contain the active ingredient, aprepitant. Aprepitant is a substance P/neurokinin 1 (NK1) receptor antagonist, an antiemetic agent, chemically described as 5-[[(2R,3S)-2-[(1R)-1-[3,5bis(trifluoromethyl)phenyl]ethoxy]-3-(4-fluorophenyl)-4-morpholinyl]]-1,2-dihydro-3H-1,2,4-triazol-3one.Aprepitant is a white to off-white crystalline solid, with a molecular weight of 534.43. It is practically insoluble in water. Aprepitant is sparingly soluble in ethanol and isopropyl acetate and slightly soluble in acetonitrile. Each capsule of EMEND for oral administration contains either 40 mg, 80 mg, or 125 mg of aprepitant and the following inactive ingredients: sucrose, microcrystalline cellulose, hydroxypropyl cellulose and sodium lauryl sulfate. The capsule shell excipients are gelatin, titanium dioxide, and may contain sodium lauryl sulfate and silicon dioxide. The 40-mg capsule shell also contains yellow ferric oxide, and the 125-mg capsule also contains red ferric oxide and yellow ferric oxide.Get emergency medical help if you have any of these signs of an allergic reaction: hives; difficulty breathing; swelling of your face, lips, tongue, or throat. 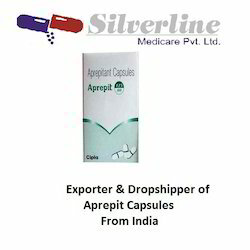 We are a reputed dealer of aprepit which is used for the prevention of acute and delayed nausea and vomiting associated with initial and repeat courses of highly emetogenic cancer chemotherapy durgs. aprepit contains aprepitant which falls in a class of medications called antiemetics. aprepit is not usually administerd as a solitary drug. it is a part of cancer treatment drugs course. Note : aprepit is a prescription drug and should be used under proper medical guidance and advice. do not share the medicine with others, since they may be suffering from a problem that is not effectively treated by this drug. Imutrex (Methotrexate) is used to treat a variety of cancers, such as skin, breast, neck, and lung cancer. It may also be prescribed to treat rheumatoid arthritis and psoriasis. This medication is proven to treat the symptoms of cancer by inhibiting an enzyme known as dihydrofolate reductase, which is essential for cancer cells to divide and multiply. 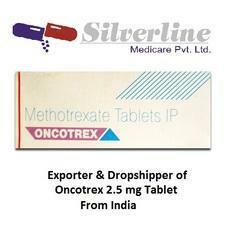 Imutrex (Methotrexate) is used to treat a variety of cancers, such as skin, breast, neck, and lung cancer. It may also be prescribed to treat rheumatoid arthritis and psoriasis. This medication is proven to treat the symptoms of cancer by inhibiting an enzyme known as dihydrofolate reductase, which is essential for cancer cells to divide and multiply. Without this enzyme the cancer cells cannot grow and are contained and eventually eliminated. 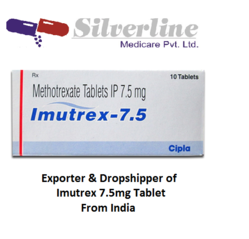 Always use Imutrex (Methotrexate) as you have been prescribed by your doctor. Never self-medicate or change your dosage without first consulting your doctor. The correct dosage can vary depending on your health, medical history, and the severity of the condition being treated. This medicine is usually taken either once or twice per week. Patients are advised to consult their doctor, in order to determine the correct dosage which is suitable for them. Fatalities have occurred in the past where people have mistakenly taken this medication too often. Always follow the instructions of your doctor, and never exceed the recommended dosage in quantity or frequency. Under no circumstances should you use this medication if you are pregnant or breastfeeding. Patients are advised to avoid all consumption of alcohol while using Imutrex (Methotrexate). Bacillus Calmette-Guerin (BCG) is used for the prevention of tuberculosis in individuals who are not infected with tuberculosis. 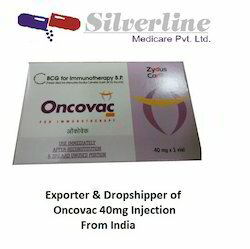 It is also used for the treatment and to prevent recurrence of bladder cancer.BCG belongs to a class of medications called vaccines. It triggers body’s natural defence system and prevents tuberculosis infection. It is also stops the progression of tumors which are located in urinary bladder.Urinary tract infections, Fever and chills. nausea, Anaemia, Haematuria, Anorexia, Vomiting, Dysuria, Urinary urgency, Bladder irritation, Flu-like syndrome., Polyuria, Wt loss, Cystitis, Malaise• You will be monitored for the presence of symptoms of systemic BCG infection and signs of toxicity such as high fever, flu-like symptoms after each treatment.• Seek immediate medical attention if you notice any signs of infection.• Discontinue treatment if you develop persistent fever or experience an acute febrile disease (rapid onset of fever and symptoms).• Tell your doctor if you are to undergo diagnostic test for tuberculin skin test as treatment with BCG may alter the result. • Inform your doctor before you take BCG if you have any artificial joints (e.g. hip replacement) or surgical implants (e.g. pacemaker or replacement heart valve), any swelling in the wall of the artery, any disease which requires drugs which weaken the immune system or you have a small bladder.• Patients allergic to BCG or any of its ingredients or any history of BCG reaction affecting the whole body should not take it.• BCG should not be given to patients with compromised immune system since birth or due to conditions causing weak immune system such as AIDS, cancer therapy.• Pregnant women and breastfeeding mothers should not be given BCG.• Patients with concurrent infections of urinary tract, active tuberculosis infection, passing blood in the urine (hematuria), positive HIV test should not be take BCG.• Also, patients who recently had a bladder operation or recent history of bleeding due to a tube inserted in the bladder should avoid taking BCG. Gefitinib is pronounced jeh-fit-ih-nib. It is also known by its brand name Iressa. It is a treatment for non small cell lung cancer that has spread into surrounding tissues (locally advanced cancer) or to other parts of the body. 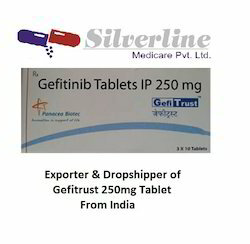 Gefitinib is also used in clinical trials for other types of cancer.Gefitinib is a type of biological therapy called a tyrosine kinase inhibitor (TKI). It blocks a type of protein called tyrosine kinase from sending signals that make the cancer cells grow. In order for gefitinib to work, the cancer cells need to have receptors for a protein called epidermal growth factor (EGFR). It is very important that you take tablets according to the instructions your doctor or pharmacist gave you. Whether you have a full or empty stomach, for example, can affect how much of a drug gets into your bloodstream. You should take the right dose, not more or less. You have blood tests before starting treatment and regularly during your treatment. The tests check your levels of blood cells and other substances in the blood. They also check how well your liver and kidneys are working. We've listed the side effects associated with gefitinib. You can use the links to find out more about each side effect. Where there is no link, please go to our information about cancer drug side effectsor use the search box at the top of the page. The side effects may be different if you are having gefitinib with other medicines. Tell your doctor or nurse straight away if any of the side effects get severe. 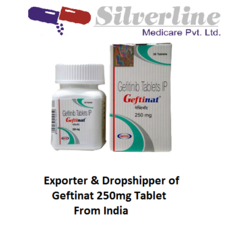 Gefitrust medicine contains generic salt content Gefitinib 250 mg. Gefitrust medicine is available in capsules form. Gefitrust medicine is manufactured by pharmaceutical company Panacea Biotec. Gefitrust is a prescription drug and should be used under proper medical guidance and advice. Do not share the medicine with others, since they may be suffering from a problem that is not effectively treated by this drug. Keep all medicines out of the reach of children and away from pets, never share your medicines with others, and use this medication only for the indication prescribed. Take this medication by mouth with or without food, usually once a day, or as directed by your doctor. We are the Leading suppliers of Etosid Injection. 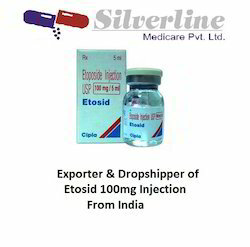 We also do Drop Shipping of Etosid Injection. (Etosid 100 MG Injection) Etoposide, etoposide phosphate is a cytotoxic anticancer drug which belongs to the topoisomerase inhibitor drug class. Etoposide is used as a form of chemotherapy for cancers such as Kaposi’s sarcoma, Ewing’s sarcoma, lung cancer, testicular cancer, lymphoma, nonlymphocytic leukemia, and glioblastoma multiforme. It is often given in combination with other drugs ( bleomycin ). It is also sometimes used in a conditioning regimen prior to a bone marrow or blood stem cell transplant. Precautions: Skin reactions may occur with accidental exposure, renal or hepatic disease, periodic CBCs (complete blood count) should be done before, during and after therapy, increased risk of etoposide-toxicity in patients with low serum albumin, acrylic material has been shown to crack and leak when used with undiluted etoposide injection. Side Effects: Nausea, vomiting, anorexia, diarrhoea, stomatitis, reversible alopecia, disturbances of liver dysfunction, peripheral neuropathy, CNS effects, anaphylactoid reactions, hypotension with intravenous (IV) injection, local irritation and thrombophlebitis at the site of injection. Storage Conditions: Store it at room temperature and in an airtight container. Keep away from light and children. We are the Leading suppliers of Tabs. 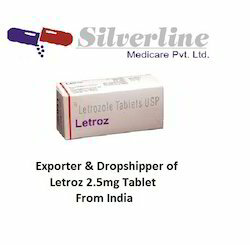 We also do Drop Shipping of Tab. Sorafenib tosylate is a white to yellowish or brownish solid with a molecular formula of C21H16ClF3N4O3 x C7H8O3S and a molecular weight of 637.0 g/mole. 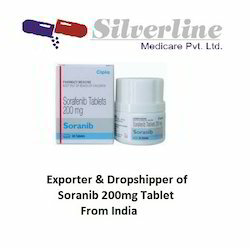 Sorafenib tosylate is practically insoluble in aqueous media, slightly soluble in ethanol and soluble in PEG 400. Each red, round NEXAVAR film-coated tablet contains sorafenib tosylate (274 mg) equivalent to 200 mg of sorafenib and the following inactive ingredients: croscarmellose sodium, microcrystalline cellulose, hypromellose, sodium lauryl sulphate, magnesium stearate, polyethylene glycol, titanium dioxide and ferric oxide red. We are the Leading suppliers of Samtica 250mg Tablet. 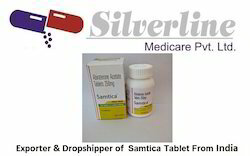 We also do Drop Shipping of Samtica 250mg Tablet. 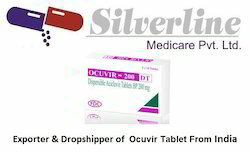 We are the Leading suppliers of OCUVIR. 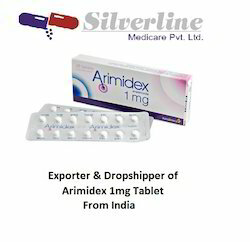 We also do Drop Shipping of OCUVIR.